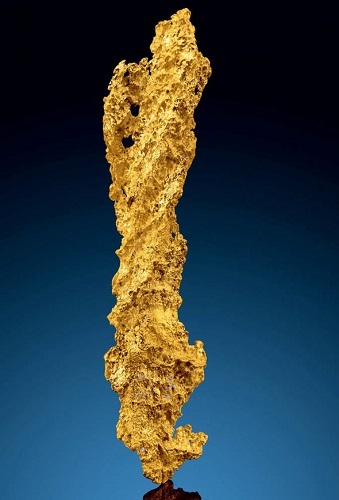 A lightning bolt-shaped gold nugget discovered in Australia has sold for an astounding $162,500 at an auction in America. Heritage Auctions hosted the sale on Saturday August 18th in Dallas, Texas, with the winning bid coming from an anonymous internet bidder for the equivalent of £127,320.37. The nugget was discovered in Victoria, Australia, and weighs 1,241 grams or 39.9 troy ounces. The lot’s description called the nugget ‘beyond compare’ and ‘worthy of any museum or private collection in the world’. Experts estimated that due to its unusually large size (10.63 inches by 2.36 inches by 1.43 inches) that the nugget would fetch up to $100,000 (£78,000) but strong competition pushed the final sale price even higher.